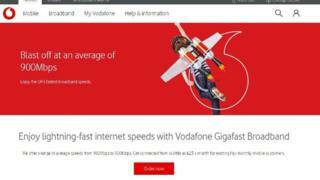 The complaint centred on Vodafone's branding of a premium offering targeted at gamers and other heavy internet users as being Gigafast Broadband. However, Vodafone's own ad recognised this was not typically the case. When the matter was raised with the Advertising Standards Authority, the watchdog said it thought that most consumers would consider the prefix giga- to be a "hyperbolic description of speed". However, it added that a significant minority could still be fooled into thinking the term referred to downloads of 1,000Mbps and higher. But it added that this would still not excuse the line "enjoy Vodafone Gigafast Broadband speeds for as little as £23 a month", since the lowest-priced package topped out significantly slower. "We considered that the... claim, unmoored from reference to a specific package, created the impression that a service that could achieve speeds of 1Gbps was available for £23," the ASA said. "In fact only the average 100Mbps package could be purchased for £23, while the average 900Mbps package cost £48 a month. "We concluded that it was likely to mislead." This marks the third time since September that a complaint about Vodafone's adverts has been upheld by the regulator. Vodafone has since amended its website to say: "Our packages start at £28 per month for new customers purchasing Gigafast Broadband 100." A spokeswoman defended the decision to retain the Gigafast branding saying: "We had made improvements to our website several months before the ASA ruling to ensure that the cost and speed of each package is as clear as possible."